Accommodation in Fife for only £49 per person, per night. 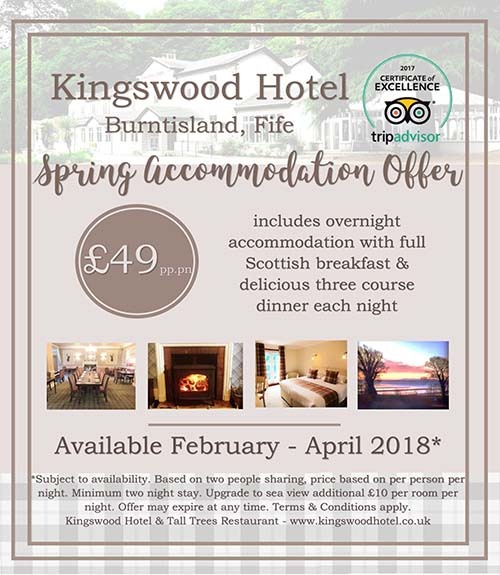 Price includes a three-course dinner, overnight accommodation in Fife at The Kingswood Hotel, and full Scottish Breakfast. Offer is available February to April 2018 and is subject to availability. Price is based on two people sharing. You can upgrade to a sea view for an additional £10 per room. Terms and conditions apply. To take advantage of this offer you must book, direct with us, on Tel: 01592 872329.